Can I register on Election Day? Yes! Minnesota has Election Day Registration. Election Protection. Minnesotans should be able to freely vote without being threatened, harassed or intimidated at the polls. If you witness electioneering in the polling place or within the buffer zone, share that with an election judge. 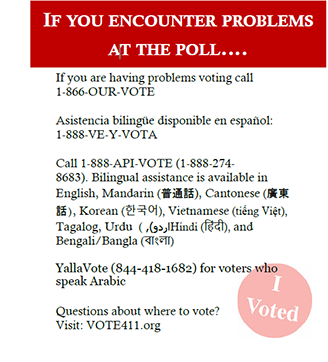 If you encounter problems at the polls, call 866-OUR-VOTE or one of the numbers on the right for assistance. And now there is nothing left to do but VOTE, encourage your colleagues, clients, friends and neighbors to vote, and watch democracy unfold. Decisions are made by those who show up and are at the table. Nonprofits across Minnesota have played—and continue to play—a significant non-partisan role in engaging and involving our communities in this important civic duty and setting the next table for elected officials. Thank you!